Deciding which method and process to use when managing projects is not only critical for the success of those projects, but also the team and the company as a whole. Typically in the marketing and advertising field, the waterfall method has been common; but as the edges of technology keep expanding, alternative methods that use a more agile approach make a lot of sense and are proven to be much more efficient. The old waterfall model for project management has been the standard for decades across many industries. This model represented working in sequential order and moving in an assembly line fashion through projects. Projects run from the idea, to the sketch, to the design, to the build. This system has worked perfectly for print and product design when items needed to be approved before they were sent to print. Once it’s printed, it can’t be altered. In order to make changes, you would have to go back and restart the whole process. Albeit, a very costly one. Although, many projects now don’t have a physical end-product. Websites and apps have the capability to be edited– even when “complete.” In essence, a website is never actually a finished product. With digital mediums, what you design is merely a guide for how we envision the final application. With so many variables: different browsers, operating systems, mobile devices, and resolutions, there are numerous possibilities and outcomes on how content is displayed and interacted with. In order to combat the ever changing landscape and constantly adding new features, we need to get to our final destination to begin testing sooner. That’s what working agile is all about. Looking specifically at websites, teams can work in parallel once the initial plan is established. That plan being: strategy, user experience, and wireframes. The design team can begin their exploration of the desired look and feel after thinking about the brand and audience. At the same time, the development team can begin building out the skeleton of the site, functionality, and desired behaviors. This prototype will allow the whole team to begin testing assumptions quickly— going through the full experience and interacting with each portion of the site just as the user would. From the flow of the website, to each individual page, to the elements, we can determine if the site will operate just as we envisioned from day one. By being agile in your processes, you’ll be able to alter as necessary without having to lose a lot of work. Simply go back and regroup on the UX and development, without really having to stop the creative team from their exploration. An agile project management process is beneficial because it allows your team to respond to change, whether it’s a client request, something that arose during QA, or a change in direction. You can see in the diagram above that there is room to retest and repeat. This isn’t the case for the traditional waterfall method. There will be less lost time, and more overall efficiency because neither your development team or your creative team will have to pause their workflow to wait for all changes to be made. If a project is managed with the waterfall method, you will never be able to test website behavior and flow until after the full design and website build— basically at the very end of the project. Everything until that point would have been an assumption that it was going to work out. Odds are, in this business of trial and error, it’s not going to work out the first time. You can see in this diagram that all of the heavy lifting was completed before the testing, and there is no room for retesting in between phases of the project. This causes a lot of lost time and repetition of work, which could have been avoiding if development was completed before the final design touches. By now you should know that design is going to change throughout development, and once your test proves you need to make changes on the development side, your design team is going to have to restart their process once again. Make everyone’s lives easier and be more agile. As a business, you want to save money and make more money. 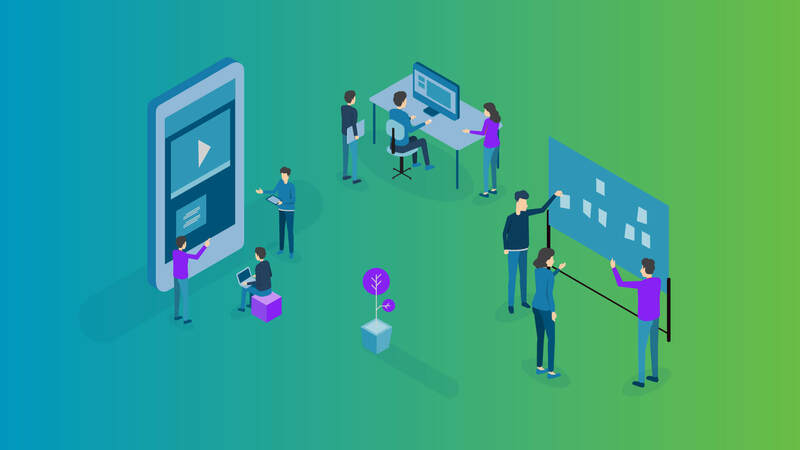 Having your team working in an agile fashion will optimize your workflow, efficiency, collaboration; as well as allow you to keep up with the constantly changing digital space. Try completing your next project with an agile management method and see how much time is saved through the duration of the project.Save time, save money, and save the lives of your team— they will thank you, and so will your client!